Dr. Romanello is a conscientious, thorough and compassionate physician who pays particular attention to his patient s lifestyles and the impact on his/her cardiac ailments. As a gifted cook, a skilled model builder and a previous marathon runner, Dr. Romanello is particularly effective at helping patients live healthy lifestyles and control stress. 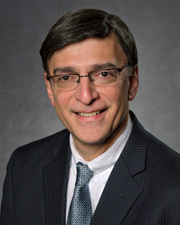 After receiving his Bachelor of Science in Chemistry from St.Joseph's College in Brooklyn, Dr. Romanello graduated AOA from Upstate Medical Center in 1983. He completed his residency at Lenox Hill Hospital in New York and was Chief Medical Resident from 1986 to 1987. Following his Residency, Dr. Romanello completed his fellowship in Cardiology at Lenox Hill Hospital. Dr. Romanello is board certified in Internal Medicine and Cardiovascular Disease as well as Nuclear Cardiology. Dr Romanelllo is on staff at Lenox Hill Hospital and has a teaching appointment at Downstate Medical Center. "When I leave Dr. Romanello's office, I'm well informed of what's going on with my health." "I deal ONLY w/Dr. Romanello. I never deal with... who I do to have COMPLETE confidence in the area of their specialty. " "Even though I have moved on to doctors in my area since retiring, I still keep Dr. Romanello as my cardiologist. He is professional & easy to speak with." "Dr. Paul Romanello is a great doctor." "Dr. Romanello is an excellent doctor. He exhibits a genuine concern for the well being of the patient. Unlike may physicians, Dr. Romanello listens to the concerns of the patient resulting in a very accurate intake of the medical problems. His vast experience results in the patient leaving with a plan of action to deal with a specific medical issue with planned follow-up." "I would definitely recommend Northwell Partners to my friends and family." "Provider was clear in explaining appropriate treatment plan ,compassionate and expressed empathy, great bed side manners. I would recommend this provider Dr. Paul P. Romanello to many friends and family members." "Dr. Romanello has been my physician for many years which attests to my confidence in him." "it's beyond very good, it's excellent!" "The best place. The best dr."
"dr. Romanello is a caring capable and competent physician"
"Dr. Romanello is an outstanding doctor. His technical skill coupled with an excellent bedside manner is an example for all to follow." "Dr Romanello is one of the best physicians that I've ever had." "Dr. Romanello has been my cardiologist for 25 years and my wife's for 10 years. He is very knowledgeable on both our medical conditions. We like the way the practice is managed as a professional medical establishment and not like a clinic." "Dr. Romanello is compassionate & caring - Overall excellent experience - Awesome doctor & awesome care. Thank you Dr. Romanello." "Dr Romanello is an elite doctor...best of the best." "Called with results on weekends." "Dr. Romanello is outstanding in every way, he is extremely knowledgeable, very concerned, very caring, a wonderful physician. " "I have referred others to the doctor." "Dr. Romanello is a very caring, careful, and thorough practitioner. He spends the necessary time with you, listens to what I want to say xand then decides"
"Dr. Romanello's care & professionalism is absolutely fantastic." "Have been followed by Dr. Romanello for a number of year and have sent multiple patients to him - "
"My doctor Paul P. Romanello is the best doctor in USH! I get much healthier and more happier with this doctor!" "Dr. Romanello is fabulous, just what you would want from a physician. And so is Shandra his assistant." "I have so much trust in all my northwell doctors. I trust dr Romanello so much. I would recommend him yes I would"
"Chandra MA is caring and professionalDr. Romanello is very special and an outstanding physician"
"outstanding physician who listens, understands, replies to all question." "Dr. Romanello was very thorough." "Dr. Romanello has always been exceptionally thorough and very caring - am very happy to be his patient." "Dr. Romanello was also my mother's cardiolo for 12 years and I was her care provider until her death. My father and brother died from heart related illnesses, she was scared to see a cardiologist. Dr. Romanello made both of us so comfortable that we enjoyed the appointments. When I had an incident he consulted with the local cardiologist via phone then I became his patient. The quality of care he provides is excellent. He care for the whole patient not just the cardiovascular system." "Dr. Paul Romanello is very caring and attentive to my health issues, concerns and treatments. I can recommend his care to anyone. " "Dr. Romanello is very thorough and has a great "bedside" manner. He provides advice and guidance without being alarmist." "Very empathetic. Keen insight into an additional drug which proved helpful." "Dr. Romanello is an excellent physician. He always addresses any concern's I have regarding my health issues." "I've been a patient of Dr. Romanello for 35 years." "Dr. Paul Romanello I would recommend to anyone. He is kind, takes his time to explain all your questions and I am satisfied with my visit." "couldn't ask for a better Dr."
"He's the best, caring & knowledgeable dr. He's never - disappointed me!" "Dr R is the absolute best in every way"
"Dr. Romanello is a concerned, thoughtful and caring physician who is responsive to any concerns I might have." "Dr. Romanellois kind and compassionate. He is thorough and reviews and explains everything." "Dr. Romanello is courteous, understanding and knowledgeable whenever I get seen by him. His calm demeanor and expertise exemplifies his work which results in a satisfied patient." "Dr. Romanello did INCREDIBLE follow-up that was never done before. I made a recommendation to a friend immediately. " "Dr. Romanello is exceptionally attuned to the care of his patients." "Paul is an excellent physician and a compassionate human being. i would not see any other physician unless he left your practice, then i would follow him"
"Romanello is great, my favorite doctor. Very thorough and helpful." "Dr. Paul Romanello is an exceptional doctor, very friendly and very orthodox." "I've been a patient of Dr. Romanello for approximately 15 years. Need I say more?" "An excellent physician knowledgeable, caring, nice personality spends time to explain and know me." "Dr. Romanello is a true professional, he is a caring , competent clinician. My visit was for a pre-op , Dr. Romanelo made me feel very confident. The medical assistants are also very good, particularly Chandra." "P. Romanello, MD focused on delivering a legendary professional medical patient and doctor relationship performing, demonstrating unwavering compassionate commitment to the highest patient care for prolonging life. He should be referred to the medical hall of fame. 1-10. All EXCELLENTLY with returned medical professional demonstration." "I was very impressed with Dr. Romanello's caring, patient, and excellent rapport with me!" "I thank god for Dr. Romanello and I am so happy and relieved to have him as my cardiologist. His excellence shines in so many ways." "#9. Excellent as I have many other health concerns - have recently made a recommendation." "My mother (and I) love Dr. Romanello. We could be happier with his care and his office." "Dr Romanello is a great doctor. He is caring, kind, considerate, listens and is expert in all things, while being personable and professional." "dr romanello is a skilled ad caring physician"
"I have confidence with my life. What is more than that!?" "it couldn't be any better"
"The physician was caring, competent, communicative as usual!" "Dr.Paul Romanello is one doctor that I would recommend to anybody,very kind,compassionate,thorough and very decent person"
"Without exaggeration, Dr. Romanello is a very fine cardiologist in all respects." "I have recommended Dr. Romanello to a few friends with coronary issues"
"Dr. Romanello is a kind and considerate MD. Takes the time to listen and provide adequate care 'Dr. Romanello is one of my favorite doctors. Travel from PA to see him -"
"Several of my friends and family go to Dr. Romanello at my suggestion. He is caring, very kind, very thoughtful and I trust him." "I asked Dr Romanello to check up on me during my hospital stay and he came every day"
"Dr. Romanello is a fabulous, caring, concerned cardiologist/Internist & he cares 100% of the time about your health & well being - His follow up is always 100%!" "The doctor squeezed me into his schedule the same day I called. Even though I was squeezed in , he took his time with me and explained everything in detail. He made me feel comfortable and I left confident in my new plan of care." "This was an initial visit for a cardiac evaluation Dr. Romanello was knowledgeable, thorough and caring - He was easy to talk to and answered all of my many questions. I'm very pleased with my visit - and feel fortunate to be under Dr. Romanello's care." "Dr. Romanello has provided top-notch care in the 5+ years I have seen him. He is my cardiologist." "My regular cardiologist was not on call that day and I was surprised to have this provider to assist during the nuclear stress test ." "I bring who needs, to Dr. Romanell and the best staff." "Concise, informative I was very pleased with my first visit." "Dr Romanello is a wonderful physician -- he's thoughtful , expert at what he does , and a great person too!" "Dr. Romanello is an extraordinary physician. He is knowledgeable, kind, compassionate - a real gem!!" "always great service when I go to the office and see my Doctor." "Dr Romanello is very easy to communicate with. He is clear and direct in his answers and instructions. We have reviewed prescribed meds at every appointment." "Saved my life by excellent exam twenty three year ago." "Dr. Paul Romanello was excellent and provided advice helpful to my surgeries at Lenox Hill Hospital over my 21 day - stay." "I've been a pt. of Dr. Romanello for many years, _____ have 2 of my family member. Excellent MD." "I would recommend this physician." "I cannot say enough good things about Dr. Romanello. I am happy to be under his care." "My last visit involved clearance for surgery at Lenox Hill. Your staff, fit-me-in nicely. As always, Dr. Romanello answered my questions and put me at ease regarding my upcoming experience." "Dr Romanello is a great doctor -- expert and caring -- a true gem!" "Dr. Romanello has always been extremely professional and through. Never rushes, always explains fully." "He is a very calm doctor & explains things but doesn't scare you & tells you it doesn't have to be done right away. We'll watch it." "Dr. Romanello far exceeds the bar for attentiveness, concern and care." "There could have been more done, for instance a stool sample." "The doctor was very thorough and detailed and listened to and answered all my questions." "Dr. Romanello is very knowledgeable with excellent bedside manners." "Very down-to-earth - made me comfortable with him." "Dr. Paul Romanello is the "very best", outstanding in every way. Extremely knowledgeable & concerned!!!" "Provider keep me informed and give me information needed ref. my _____ condition." "I have recommended him to several and their comments to me were similar to mine and thankful." "MD devoted towards his patients, Dr. Romanello is a wonderful doctor endless, extraordinary, goes far to care for his patients." "Even through Dr. Romanello is my cardiologist. He is helpful to me and my medical needs."